With the popularity of tattoos and piercings on the up in recent years, it’s no surprise that people from all over the globe are choosing to express themselves in new and exciting ways. Body modification was already pushing boundaries: tongue splitting, scarification, and ear pointing are just a few of the alterations people are having done in an attempt to change their appearance. 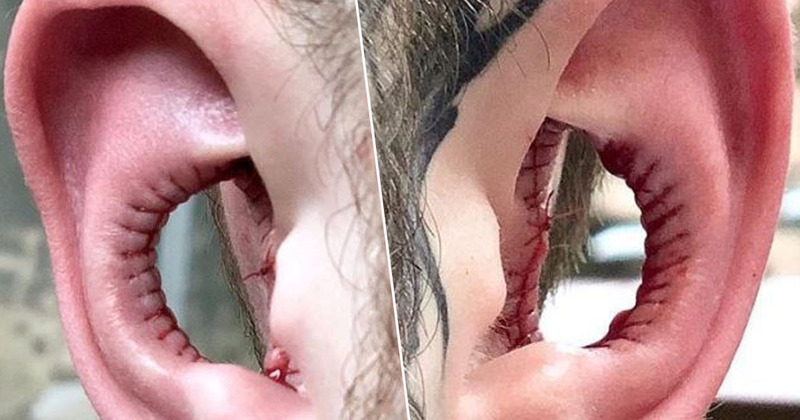 Raising the bar even higher is one man from Australia who travelled across the world to have the inside of his ears removed – all for the sake of body modification. First off, I’d like to make a disclaimer: what you’re about to see isn’t for the faint-hearted. Trust me, even looking at the pictures made me feel slightly funny (and not in a good way). The man, Charles Bentley from Australia, travelled all the way to Stockholm recently (just a small 8,600 miles away – no biggie) to get the procedure done at the Calm Body Modification studio. Sonchai Maibert, who owns the studio, posted two pictures of Charles’ finished ears on the company’s Facebook page, attracting a lot of attention. Yikes. See what I mean about feeling funny? Chai wrote an informative message to accompany the pictures, challenging myths surrounding the procedure – particularly about a rumoured loss of hearing after having it done. Fresh #conchremoval on @charlesvbentley who traveled around the world from Australia to have this procedure performed by me at @calmbodymodification. Truly humbled! To get some facts straight note that this procedure doesn’t make you deaf. It might impair your ability to hear the direction of sound for the first week or two until your mind has adjusted to your new ears. Hearing from behind will in fact improve. Our ears doesn’t ‘catch’ sound as it did eons of years ago when our ears were bigger hence why we have to create a bigger ‘ear’ by cupping our hand around our ear to hear better. Remember to #BeCuteOrStayMute when commenting because I will block you if you’re being rude. Regardless of Chai’s insistence this procedure will not have a detrimental impact on anyone’s hearing – even saying it would improve hearing from behind – people still had concerns. A lot of them. As an audiologist this is really making my eyes bleed. The whole post, picture, everything. Please for the love of your own ears and hearing, do not get this procedure done thinking it won’t make a difference to your hearing. Please use your brain with common sense before getting such procedures done. Please. Our ears do catch sound. The entire pinna and concha are what funnel the sound down the canal to the ear drum. The shape of our concha directly ties in to how well we hear. I have patients with missing pinna due to various cancers and it has permanently adversely affected their hearing. Let’s just say I definitely won’t be googling conch removal again anytime soon. This is the first and last time I ever want to see this.